When I saw Elise‘s post about mushroom caviar, I was immediately interested in it. It’s a cross between dip and “real” food, not to mention that it’s different from most of the dips that I have on a regular basis, so I thought it would be a great summer snack. And I was right. This dish is called “caviar” for its slight physical resemblance to the fishy product and to make it sound a bit more posh than “mushroom dip.” It comes together easily, with chopped up mushrooms and shallots, followed by a bit of garlic and seasonings, all of which is sauteed until tender. I didn’t have an open bottle of white wine, so I left that out, as well as omitting the pine nuts (sorry, Elise). The caviar is served cold, so it can be made in advance, and is made creamy with the addition of a little bit of sour cream. I actually used plain yogurt instead of sour cream and, since I didn’t measure it, my caviar appears to be slightly creamier than Elise’s. 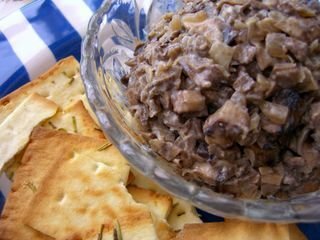 The sour cream/yogurt helps the mushroom bits to stick together, so you can form it into an attractive round on your serving dish that looks almost like pate. I’ll be making this again many times. I served it with some garlic crackers that I picked up at Trader Joe’s, though it also went extremely well with pita chips. Sautee mushrooms and shallots in a large skillet, with the butter, salt and pepper, over high heat until quite tender, about 5-7 minutes. If you’re including pinenuts (which will add a nice crunch), lightly toast them in a small skillet (1-2 minutes), then set aside. When mushrooms are slightly tender, add in the garlic and white wine (if using), and cook until for an addition 1-2 minutes. Transfer to a bowl, along with the pinenuts, and refrigerate until cool. Once chilled, stir in lemon, sour cream/yogurt, parsley and a bit of cayenne. Add additional salt and pepper, if needed. Refrigerate until serving. Yum – I saw this over at Elise’s and I’ll be making it too, and soon! that looks very good indeed, both yours and Elise’s! That looks delicious…something yummy and easy when you have company over, especially since you can make it ahead of time. Thanks for sharing this 🙂 Checked out Elise’s too…yum! Sadly, we don’t have too many mushroom varieties here…what would be the closest substitute? Cremini mushrooms are, I believe, small portabellos, so you could easily substitute them in this recipe, Joey. Love the name lol! I make this a lot to accompany haricots verts or another green and it is dubbed by my kids as “mushroom mess” . Hmm I think I’ll adopt the “caviar” it makes it sound like a real real dish. I had the same reaction when I saw the post at Elise’s – then when I saw you made it as well I couldn’t wait to give it a try. I’ve made it twice this week to rave reviews. My experiences are blogged in my latest entry.